A few weeks ago, when I stayed up all night being sick, all I wanted to do the next day to take a leave from work and sleep. The idea was to sleep until 10 am and then drop a message to my manager about being sick. It was just 6 am then and I thought I had more than enough time in hand. My eyes were exhausted as I hadn't slept a wink the previous night and I was having a terrible headache along with severe body pain. It was gloomy outside and it was the perfect weather to cuddle up inside a blanket and go to sleep. I had just closed my eyes when I woke up to a loud sound. That of a Shehnai. I stay on the third floor of an apartment complex, so imagine how loud it must have been. Turns out it was a religious procession by a man and his gaudily decked up cow asking for alms in exchange of blessings. Why he had to be so loud I do not know. I sat up in bed holding a pillow to my head, struggling to fall asleep while the noise stopped after a good thirty minutes. Finally relieved, I slithered under the sheet again to get some much deserved shut eye. Then began then noise parade. First, it was that of a bell that my neighbor was ringing during his morning puja. It was then followed by a loud religious anthem of a procession of God on my street. Religious songs praising God bombarded my ear drums as I struggled with a blazing head and lack of sleep. This went on for a good two hours and by then I was up from bed, had finished my morning tea and had decided to work from home instead of taking a leave. Yes, I could have gone back to sleep once the noise subsided, but I did not trust it enough for it to not return. The things we humans do in the name of God and religion is so troublesome to every one around. While I'm more of an agnostic than an atheist, I do not have anything against people who are religious and hold on to their beliefs. It is the unnecessary drama in the name of God that bothers me. I know that people like to pray to God in their own way. I do it in the form of a thank you every once in a while but others seem to want their prayers to be literally heard by the God up above. Before Cal and I moved out on our own, we lived in a house where they used to play bhajans every now and then and sometimes throughout the day. No matter what it is, everything sounds like noise to me in the morning. People need to understand one thing. No matter how much you pray or how loudly you play the religious music, you will only get what you deserve. All that they are incurring now is a hefty power bill thanks to the "Om" chants morning, noon and night. 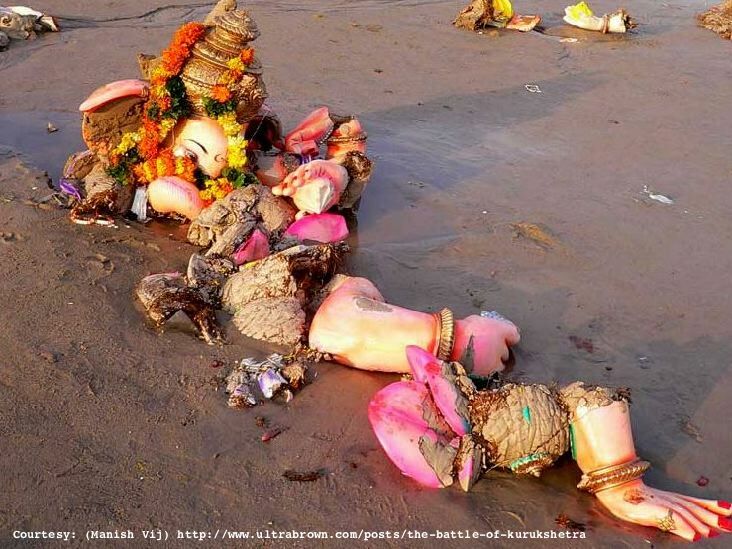 Image Source - This is what happens to Gods after the prayers are done. The festive season is back again and while our lakes are yet to resume breathing after the Ganesha immersions, we are waiting in line with the Durga idols. Every corner of the city is decked up in pandals causing traffic jam in every street. Loud speakers are set up everywhere and after the first couple of hours of bhajans, there is always room for a Munni or a Sheela. All of this in the name of God. While cricket unites us, religion and God divides us. The things people do in the name of God appalls me. They cause noise pollution disrupting day to day life. Diwali is round the corner and the pollution that comes with it cannot be measured. Festivals are meant to be a celebration, but we humans make it a matter of status and pride. The louder the music, the stronger the faith; this seems to be the mantra. While Diwali is a nice and happy festival, I hate the destruction that comes in its wake. While people burst crackers worth lakhs to show off their bank balance, nature silently suffers. Is there anyone who realizes this? There is a temple near our house that Cal regularly visits and I occasionally accompany him. Of late I've noticed a man there with a cow. The animal has an additional limb on its back and the man uses this to make a living. Again, in the name of God. Give him 50 bucks and he will take the malformed limb of the poor animal that is clearly in pain and place it on your head for a brief second. Something inside me breaks every time I see this. We humans tend to create God in every possible thing. Be it an oddly shaped stone or a deformed animal. This of course is followed by loud prayers and calls to God usually in the form of unheard or unseen musical instruments that scream out a tune that causes pain in every part of my body. If there are specific houses of worship, why can't prayers to God be limited to that? Does every street need to have a Ganesha or a Durga pandal? All this leads to is traffic and it disrupts daily life as you cannot sleep, work, read or study in peace. Believe me, if God is watching, he is having a hearty laugh. Two days ago a thirteen year old died while fasting for 68 days for bringing good luck to the family. This was a ritual and when she died, the family celebrated her death. This funeral or celebration was attended by 600 odd people. A few weeks ago there was an article about the red roads in Dhaka after Bakrid. The streets has turned red thanks to the animal sacrifice and rain. Those images were so disturbing that it is yet to get out of my system. I once witnessed a procession where in a large group of people were beating themselves on their chests while having blades in between their fingers. The thought of it still makes me shudder. People were watching them with jaws open wide while the men bled and screamed away to glory. Immensely disturbing, to say the least. While hard work and self belief have taken a back seat, God continues to be the center of being for many people. Since it is a matter of every individual's faith, I do not question it. Have faith, it is a very good thing. But you do not have to show it off on a grand scale. I have nothing against God. Or against worship. But must you disturb everyone and everything around you while doing so? Prayers are supposed to make us feel calm ... feel at peace. But all this loud music followed by munni and Sheila is a total nuisance. How can anyone feel devoted ... making money on someone else's faith is a big business now... I think even Durga Ma would have killed the Asura more quietly. Hope you feel better soon... enjoy your tea. Faith is definitely a business now. Really sad. This is a bitter truth after every festival. I remember last year after Diwali, the roads strewn with paper bits of crackers and garbage piles all around temples. The city of Delhi looked like an utter mess, yet everyone went about leadig their lives, seldom affected by what they have generated in the name of festivity and worship. So true. People like that nothing has happened once they are done and dusted with the festivities. It pains to see the plight of nature after that. I couldn't agree more. Noise levels is just one part of the story. There are any other rituals, practices that are annoying. In the name of God, everything sells and that pinches me too. I do believe in God and turn to Him but I am not a follower of any practices. The fact that it sells is what is scary. 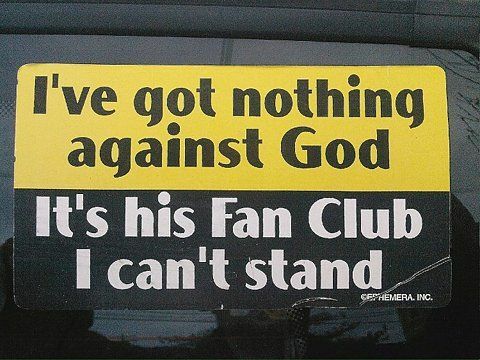 I love that quote - God's fan club is annoying. We are on the 9th floor and have been driven crazy right since Ganapati kicked off. We got a short break and then Navaratri started. I wonder if the Gods would be happy with raunchy numbers blaring out all day. With the kids' exams it's just been worse. Did you watch PK? The film made some very valid points. Oh that's really bad! PK is a movie which showed the truth and I loved it. I like how balanced your views are, Soumya. You haven't dissed anyone , yet put your point across. Valid points, Soumya! I hate loud music in the name of festivals. Crackers going off all through the night during festival season is a mere annoyance for me. Diwali is such a great festival but I hated every bit of it while in Bangalore when the streets were took over by the fire crackers. They don't even mind that people are on the street. What all in the name of God! I'm glad you agree with me Vinitha. Dogs face the wrath of Diwali the most and it just breaks my heart.